Most of the gunfights take place in the center of casino, which pays tribute to other Call of Duty maps and modes with slot machines named after Nuketown and Zombies mode’s Pack-a-Punch machine, but those appear to be just subtle nods to the series. Why does Ruin get to be immortalized on canvas, and why is Savannah Mason knighting him? Maybe this is nothing more than random art of one of Black Ops 4’s popular Specialists, but it could mean something more. By the way, the other Specialists aren’t completely left out of the casino’s art collection. There is an awesome ceiling mural depicting them painted in the style of Renaissance masters like Michelangelo and Correggio. Lockup’s map locale is a police headquarters in the aftermath of an attack by a criminal organization. Treyarch designed Lockup to create more verticality with rooftop fights; when I play, I definitely spend most of my gunfights outside the station. However, you’ll get some story clues if you explore the burning interior of the offices, especially if you visit the Investigations area of the building. The desktop monitors show someone was trying to transfer data, but what information were they after? There’s a good chance it pertains to an ongoing investigation, which we can see via a corkboard filled with clippings describing connected news events. The top center news clipping reads: LAPH detectives going to the FBI after several incidents around the globe confirmed to be linked together. For example, Hacienda is also shown as part of Lockup’s investigation, but that map has an investigation wall of its own. Loaded up with guns and coke, Hacienda is a mansion owned by an unknown crime boss who is investigating attacks against their crime organization. A ledger from Hacienda looks identical to one found in a room of guns and coke on the Contraband map, possibly tying their organization to the gun and drug smuggling taking place on the island. The spider web of investigation locations feature various maps from the Black Ops series and ultimately point to a man with an eye patch, and although it’s not definite, that seems likely to be Raul Menendez from Black Ops 2. 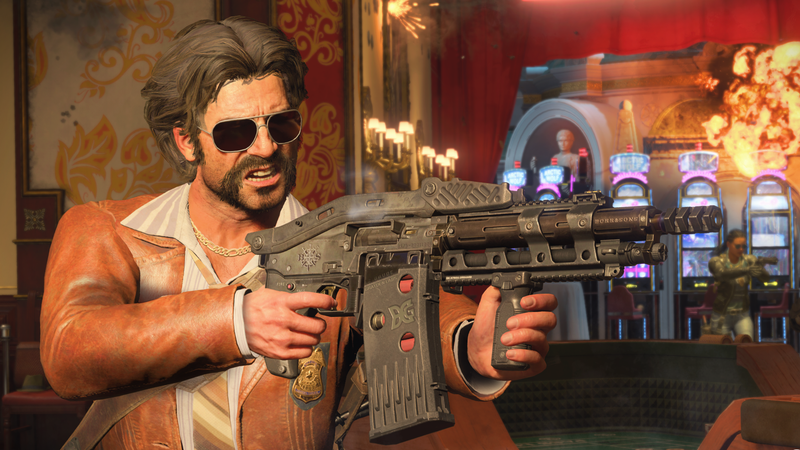 Menendez continues to rock his eye patch as an unlockable character in Blackout, and he’s also demonstrated as being linked to Savannah Mason according to the audio files unlocked in the Specialist HQ. I also took note of the clipping with a sticky note that marks an event as “confirmed” on a Russian freighter anchored in an LA harbor. This doesn’t fit any of the current maps, so could this be Treyarch teasing a future DLC boat map?